Association of Significant Cemeteries of Europe: Happy Birthday, Mr. Architect! 2018 marks the two-hundredth anniversary of Maciachini’s birth. The Friends of the Monumentale together with the Municipality of Induno Olona have promoted an ad- hoc Committee to organize events, meetings and activities to take place in different locations during 2018. Celebrations start Friday, 6 th April at Induno Olona, where Maciachini was born on April 2 nd , 1818. 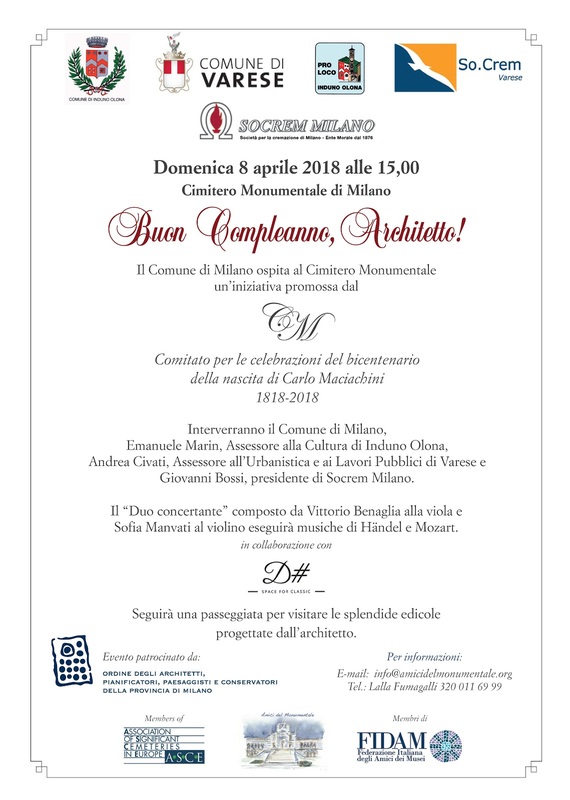 Postal cancellation of commemorative postcards and stamps issued by Poste Italiane will be performed on Saturday, 7 th April; a guided visit at the Induno Cemetery that holds some monuments designed by the architect will follow. 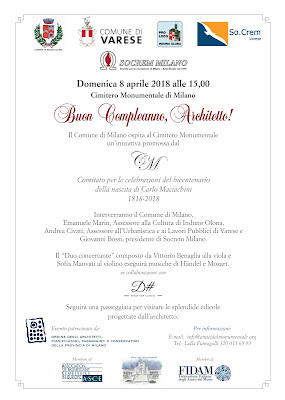 Sunday, 8 th April, the Municipality of Milan will host a ceremony in front of Maciachini’s tomb with music by Haendel and Mozart played by a string duo and promoted by the Committee and Friends of the Monumentale. A guided walk to Maciachini’s vast production of monuments in the cemetery will complete the program of the day.